The primary role of architecture is to provide an orchestrated plan to meet short term and long term Manageability & Automation (M&A) objectives. Architecture is all about technical planning and can enable reduced operational costs and agility if done correctly. I strongly believe that architecture can help accelerate the rate of change and provide real value for "M" and for "A". 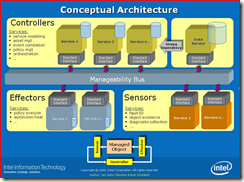 The below graphic is one which does a good job of articulating the need for a manageability bus. Unfortunately, he misses the simplicity of explaining what you need is a closed loop feedback system as he has this diagram which is drawn backwards. 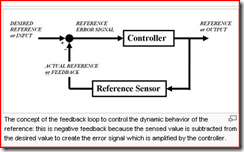 I am amazed at how often the IT community misses the opportunity to use control theory to explain management systems. Most IT systems actually run open loop. On a related topic I had a chance to meet with a fellow consultant, Michael Emanuel who has worked on IT management tools, and knows of a company developing some innovative solutions to the challenge of building a closed loop management tool for a Green Data Center. After I have had a chance to review the product features, it will be in a future blog post.